Members of the Bermuda Overseas Missions are heading to Guyana to help build houses for those in need. Volunteers from the Bermuda Overseas Missions (BOM) have planned their next trip — taking them to Guyana to join the Habitat for Humanity charity. It’ll be the 18th overseas trip for the BOM group who aim to help the homeless and poverty stricken residents. 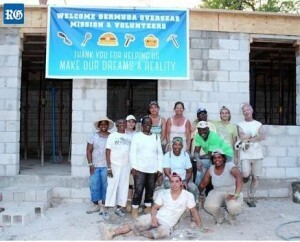 While in the South American country — which borders Venezuela, Brazil and Surinam — the Bermudians will help build houses. The visit is planned for July 26 to August 9. Earlier this year, in March, they worked with the Feed My Lambs organisation in Haiti. Mr Thompson noted that the mission would include approximately 10 days working on the homes but they hope to visit a local school, daycare centre or orphanage to distribute toys, school supplies and clothes to needy children. “At the end of the trip we plan some non-work activities to include a visit to the Kaieteur National Park in the Amazon forest to see the Kaieteur Falls which is the world’s highest single-drop waterfall and an incredible 741 feet high,” added Mr Thompson. Limited spaces are available to join Guyana group and participants must be 16 years of age. In support of the trip, BOM has arranged a Fish Fry at Christ Church, Warwick on May 20, prepared by well-known chef Keith’s Kitchen. Previous: Was there a hidden hand in the unrest at the Camp Street Prison?